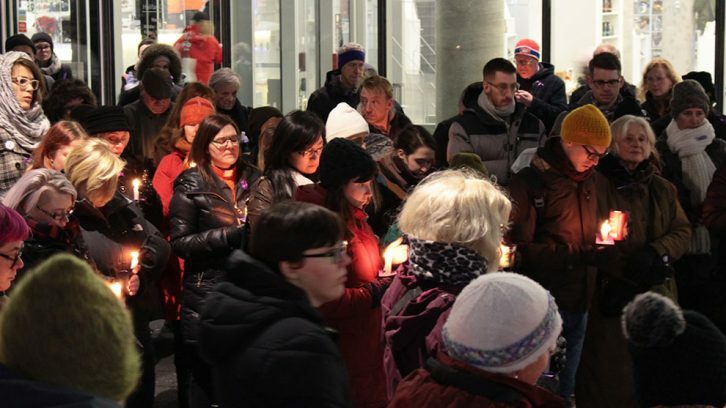 A candlelight vigil was held Tuesday night at the Halifax Central Library to mark the anniversary of the massacre at l’École Polytechnique de Montréal. Twenty-seven years ago, a gunman killed 14 women on the university campus and wounded nine others, claiming his hatred of feminists as his reason for the attack. “This particular anniversary hits me hard,” said Rev. Anne Hoganson, who came out for the vigil. Hoganson was working at Technical University of Nova Scotia (now DalTech) when the shooting took place. After a minute of silence for the victims, the participants — a group of about 135 people — began with a memorial walk. They passed by the lieutenant governor’s house where a brief demonstration was held, demanding action on violence against women. “End the violence. Stop the silence,” vigil attendees chanted. The vigil rounded back to the interior of the library, for speeches, music, poetry readings and food and coffee donated from local businesses. A slideshow of artwork done by female survivors of violence and abuse, was projected in front, with captions that read: victim, quiet, confusion to strength, broken and new life. Poet El Jones read in a fiery torrent of questions and denouncements, referencing concurrent issues (the disappearance of Ashley Simpson, the rate of sexually assaulted women in prisons). By the end, the audience was roused from their seats in applause. There was also a speech by Adam Reid, recently hired as Halifax Pride’s executive director, who was the only man to speak at the vigil. 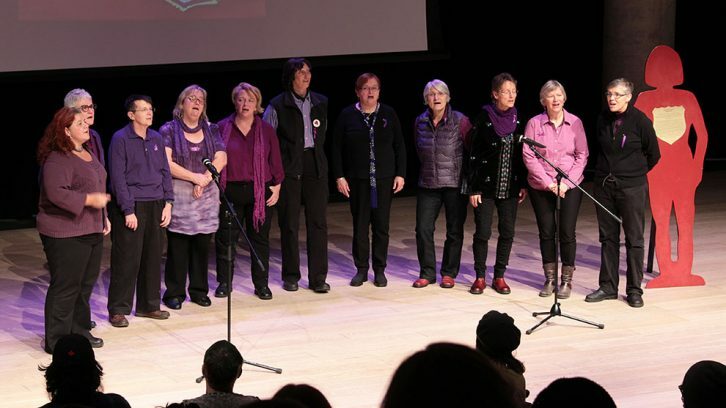 In the wake of the massacre in 1989, Dec. 6 was turned into a National Day of Remembrance and Action on Violence Against Women. This year’s remembrance also coincides with the United Nations 16 Days of Activism Against Gender-based Violence Campaign, from Nov. 25 to Dec. 10.